Get ready to bloom with us! 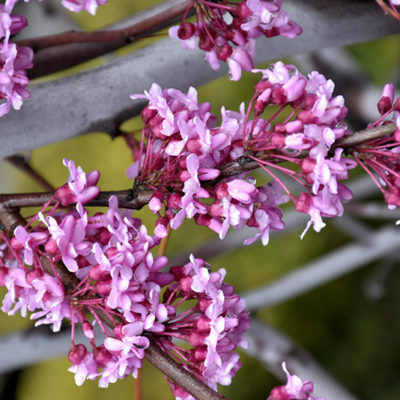 Learn about some of our early spring bloomers including magnolia, ornamental cherry, redbud, witch hazel and spicebush. Make your own backyard retreat a reality – visit Wannemaker’s today to find all of this and more. We have fresh shipments arriving daily! Magnolias are in many ways an heirloom plant. 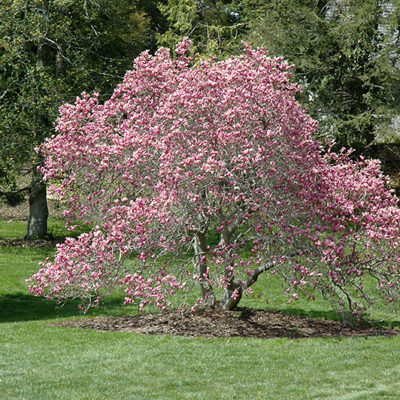 Grandma may have had a big saucer magnolia that covered the front lawn and turned into a pink cloud every April. Now, there are many more varieties of magnolia that are easier to tick into a small landscape, such as ‘Ann’. It will reach 8 to 10 feet over time and blooms about mid-April. to find magnolia on our plant guide. There’s nothing quite like an ornamental cherry in full glorious flower, however fleeting. We carry both upright and weeping trees, but one that has particularly caught our attention is a weeping variety called ‘Extraordinaire’. It features huge many-petaled flowers that look like pink pom-poms! At 15 to 20 feet, it will need a bit of space and lots of sun, but in autumn it also treats us with beautiful orange fall color. 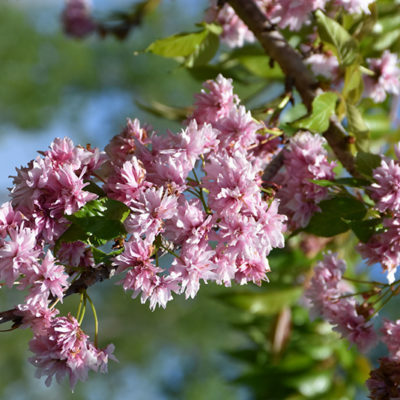 to find ornamental cherry on our plant guide. In April, redbud begins to bloom and our woods and neighborhoods are filled with an almost ethereal pink smoke as the tiny pink pea-like flowers cover the twigs. 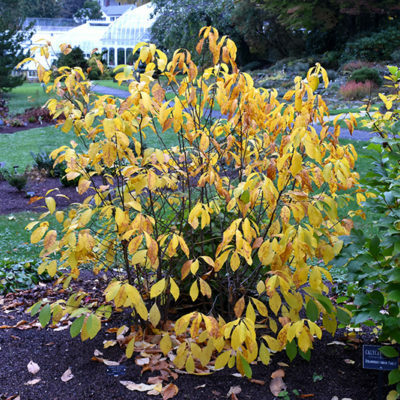 This easy-going, edge of the woods native tree is a favorite of Midwesterners for its early prolific bloom, large heart-shaped leaves, and golden fall color. The straight species tops out around 20 feet in full sun or part shade, but we also carry weeping varieties and purple-leaved selections. 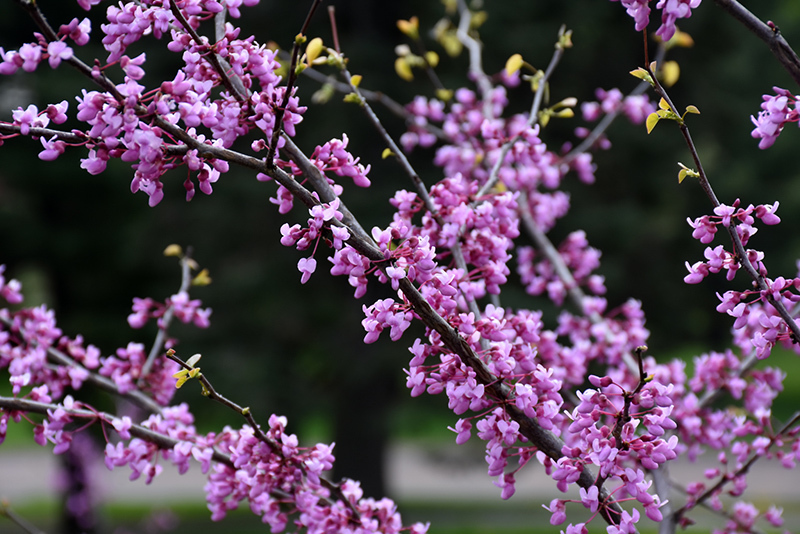 to find redbud on our plant guide. Often the first shrub to bloom, witch hazel is a large shrub that bewitches with its unique fragrant flowers in March. With an elegant vase shape reaching about 12 feet, it features large crinkled green leaves in summer and a rich gold fall color. However, we love it for saving our sanity after a long winter with its cluster of strappy yellow flowers. 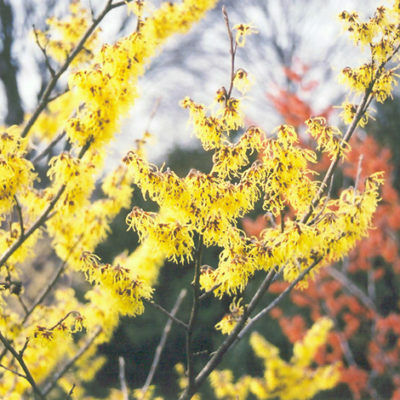 to find witch hazel on our plant guide. to find spicebush on our plant guide.